These tiny kitchen trends look good, serve a purpose and help even the smallest kitchens feel bigger. The tiny house movement is stronger than ever and with a tiny house comes a tiny kitchen. 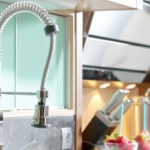 A tiny kitchen can be a complete disaster or a tidy and functional space, it all depends on how you design it and use it. A poorly designed tiny kitchen can make you feel claustrophobic, disorganized and downright irritated. But when properly executed, a small kitchen offers greater simplicity than any oversized kitchen. Because in all seriousness, how many things do you really use in your kitchen on a daily basis? The following tiny kitchen trends can help you score a highly functional kitchen with very little square footage. The most important rule to designing a functional small kitchen is to recognize it for what it is and not push it to become anything more. A small kitchen can accommodate storage and food prep/cooking, and that’s about it. If you start trying to add other elements you’ll end up with a cluttered and overwhelming mess. A tiny kitchen is not the place to cut coupons, store mail or do homework. Focus on what the kitchen must do and reserve other parts of your home for additional tasks and storage. Thanks to the tiny house movement there are lots of scaled-down appliances on the market, including mini-size microwaves, ovens refrigerators and freezers. You don’t have to go tiny in every department, we get that some things just can’t be micro-sized in your life. Perhaps you need a large refrigerator, but don’t use your microwave as much so you can go tiny there. A rollaway bar cart or island can serve as the perfect place to store little odds and ends, as well as prep food. The best part is it can be rolled away into a closet or corner when it’s not in use to save space and prevent clutter. Patterned cabinets can leave your tiny kitchen feeling even smaller. Even large or flashy cabinet handles can start to overwhelm a small space. 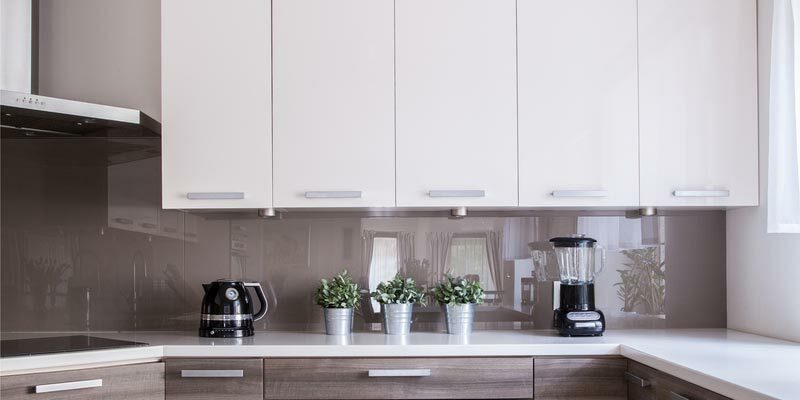 Light and bright cabinets with simple, concise and practical handles help open up your space so that it feels less cramped. Lighting has the power to change the entire feel of your kitchen. Shoot for a mixture of task and atmospheric lighting. Pendant lights can make a great accent piece when hung over eating areas or at the center of your kitchen. 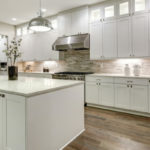 Installing incandescent lighting beneath your kitchen cabinets makes your space feel larger. You could also add lighting above cabinets or under base cabinetry for even more effect. Your eye naturally moves down to the floors when you walk into a space, so make sure your floors stand out. 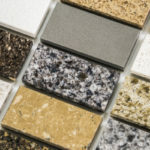 Since square footage is small, you might be able to afford fancier flooring that really makes your space pop, like marble. Cork is a more affordable option that’s fun, durable and eco-friendly. Linoleum and checkerboard pattern tiles are other popular examples of flooring options for tiny kitchens. Windows and mirrors are great (and affordable) tools to open up a space and make it look and feel larger than it really is. That’s why so many tiny kitchens incorporate a large mirror on one side. Adding a mirror is more affordable than cutting a window into the wall, but if possible a new kitchen window makes a lovely addition that prevents the space from feeling claustrophobic. Glass can be incorporated into furniture, backsplashes, kitchen doors or wall accents. Go for the glass, it’s going to make your space look bigger while brightening up the room. 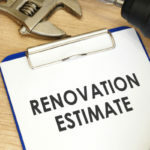 Plus, if you incorporate glass into doors or wall separators, you help open up the kitchen to other parts of your home. Small spaces can’t handle any clutter or else they start to look and feel like a mess in no time. By adding magnets or small shelves to the inside faces of cabinetry you create useable space to store spices, coffee mugs, knives and so forth. You might be surprised by all of the things you can store in this otherwise wasted space. Open face cabinets are a popular option for small kitchens because they help open up the space… but only if you keep your cabinets clean and clutter-free. If that sounds like an impossible task in your kitchen, avoid open-faced cabinetry at all costs. One good thing about open face cabinets is that they force you to be more organized and eliminate clutter. A supersize pot hanger in a small kitchen can go all types of wrong. On the other hand, a petit pot hanger hung in the right location adds more storage space to your tiny kitchen without using any square footage. Plus, attractive pot hangers make nice accent pieces. Don’t feel like you have to use the same materials throughout your entire kitchen. Mixing and matching materials is a definite yes! Variation grants your space more architectural details and can actually make it feel bigger due to the variety of color and style. Start by making a design board with samples and swatches of all of the colors and materials you want to use. This will help you decide if they mix together nicely or look like a thrown together mess. Keep trying until you find a combination that works.